Back in 2006 I had purchased six bottles of this 2003. 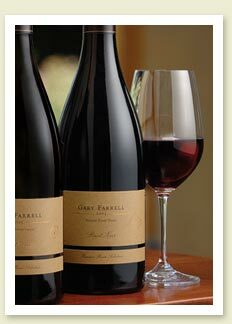 Gary Farrell makes other varietals but they are known for making extraordinary Pinot Noir’s. The very first bottle I opened in 2006 was a fairly big Pinot Noir, earthy, big tannins, a bit hot. I knew it would age well. Over the next few years I opened up each bottle to taste the difference. Here we are in 2011, my last bottle from this vintage. It was much lighter, the bouquet much softer of soft red fruits. The original spicy oak that it had been now just mere hints of oak with a flat finish. It still had ripe cherry, raspberry and strawberries. This was a perfect Russian River Pinot Noir that aged very well over the years. Quality and consistency was there. This entry was posted in Pinot Noir and tagged age worthy, Gary Farrell, Pinot Noir, ripe cherry, Russian River. Bookmark the permalink.